Simply create a Simkl account and install the IM CVR product. One click on the IM CVR icon provides the user with instant access to all of their online conversation history. And the history.im address couldn't be easier to remember. The icon can be rendered invisible to avoid desktop clutter. IM CVR also supports full text searches of the chat history. The user can view their history from any computer regardless of location. Conversations conducted on multiple computers can be recorded to one account through a combined chat log with all duplicate entries removed. 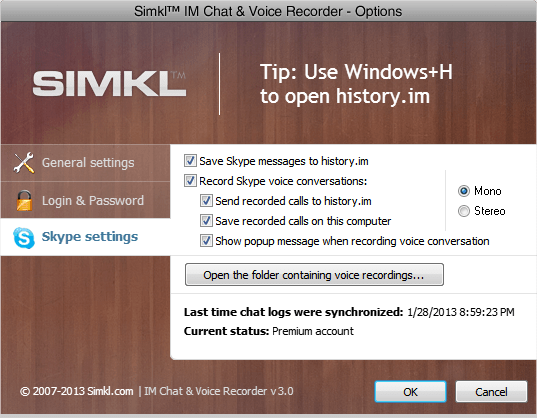 Simkl IM CVR can record Skype calls locally, directly to an MP3 format in addition to creating an online history. A backup can be a valuable resource in the event of PC crashes or forgotten passwords. The IM CVR backup allows users to use the Simkl WAP interface to retrieve contacts using a web browser or a mobile device. IM CVR V3.0 - It's simple to use.